We have a 24nm SI-TEX Radar. The dome is on a gimbaled mount by Quasar attached to the backstay. 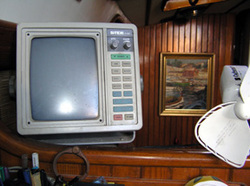 The screen is mounted at the NavStation and easily visible from the steering wheel. The documentation is in the stbd documentation locker. The only problem we have experienced was a loose wire at the screen end of the cable, costly to track down but easily fixable! The radar technician said inside the dome was exceedingly clean with no traces of corrosion that he usually sees on other boats. It works very well, we have never seen anything it hadn't spotted a long time before. It was especially useful when surrounded by 20-foot waves which you can't see through as we experienced on our way to Panama. The alarm came in handy during my solo passage. We always disconnect the screen during lightning storms. What are people saying about Sailing to Jessica?